Lessons are offered in 30-minute, 45-minute, or hour-long sessions and meet weekly. Tuition is due monthly at the first lesson of each month. Please contact me for rates, scheduling, and studio policies. I am also available for chamber music coachings. My students have participated in Michigan All-State Orchestra and received superior ratings in Solo and Ensemble at the local and state levels. They have placed in the finals of the Shar String Quartet Competition and regularly attend summer programs at Interlochen Arts Academy and Blue Lake Fine Arts Camp. Students have gone on to pursue music degrees at The University of Michigan in Ann Arbor. I have had the privilege of working with many inspiring teachers who have greatly influenced my teaching style. I use the Suzuki approach in combination with my own ideas, catered to each student individually. I highly recommend Suzuki for young beginners and believe that a high level of parental involvement is necessary to achieve success. I also have adult students who are making wonderful progress. You are never too old to start playing the violin! 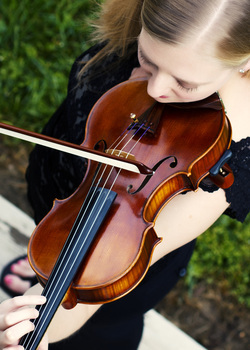 Regardless of age or level, practice outside of your lesson is expected for improvement. A limited amount of progress can be achieved in our weekly lessons, therefore your time at home is essential. We will discuss a reasonable amount of practice time together, as well as ways to make practice time efficient and enjoyable. Studio recitals are held twice each year. Participation is expected of all my students.